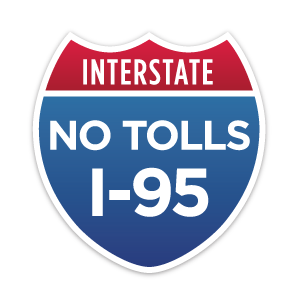 Governor McCrory: Withdraw your application to toll I-95 from the Federal Highway Administration! During his campaign, Governor Pat McCrory publically stated his opposition to tolls on I-95. Now, it is time for him to keep his word and rescind North Carolina’s application to the Federal Highway Administration to toll I-95. The North Carolina General Assembly is currently in session. There are a number of pieces of legislation that would keep tolls off of I-95. We need to tell our elected officials to SUPPORT SB 218 and HB 267. Email and call legislators TODAY and tell them that tolls on I-95 are highway robbery and they need to be stopped. HB 267: AN ACT to prohibit the imposition of tolls on existing interstates without prior approval of the General Assembly. SB 218: AN ACT to prohibit the imposition of tolls on Interstate 95 for TEN years and to require the prior approval of the General Assembly for tolling Interstate 95 thereafter.